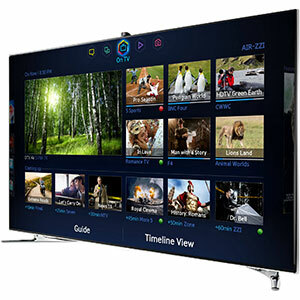 As the king of Samsung's 1080p LED HDTVs, the F8000 series flourishes a crown encrusted with resplendent jewels like a quad core processor, voice and motion controls, and a Smart Hub overflowing with apps, social media, and smart recommendations. But the most eye-catching, show-stopping feature of the F8000 TVs remains their top notch video performance. I could chatter on about the TV's dimming (Precision Black Local and Micro Dimming Ultimate) technologies, but the essential point boils down to the big, bright, colorful picture that will impress you and your significant others. For me, most of the other gee-whiz features just get in my way. Luckily, they can be shunted into the background. Of course, if you are a thoroughly modern media maven, these assets are at your fingertips or your beck and call - literally. The dimming processes definitely enhance Samsung UN55F8000BF's contrast and black levels. Though, to my eyes, the picture is not quite as silky as produced by the best plasma displays. This LED TV is flexible, allowing you to adjust it to your tastes. Even with the addition of a built-in woofers, the sound from the integrated audio system does not approach the video quality. If it's features you want, then this Samsung delivers with built-in Wi-Fi, an integrated video camera for Skyping, apps and more apps, voice recognition and motion control, 3D, Bluetooth, MHL and ARC support and the beat goes on. Of course, if you want to to use all those features, plan on some study and setup time. You may even need to crack the manual open. On their website, Samsung lists the suggested price for the UN55F8000BF as $3099, which is a tad pricey, even for this top of the line, feature-packed TV. But at the time of this review, the tag was cut to $2499 and a 29-inch LED HDTV was included. Now we're moving into good value territory. The free TV offer probably will disappear, but who knows what incentive may replace it as we approach Black Friday.